It’s time for a walk! Peppermint waits on the front steps for me to come outside. Most of the time she’s a very obedient dog, but sometimes the Jack Russell in her surfaces and no matter how many times I call her name she just ignores me. Oh, she’ll glance at me from a distance when she hears me call, but then she kind of gives me a dog shrug and trots over to whatever is holding her interest. Sometimes it’s so aggravating to watch her, knowing that she knows I want her to come. She’ll stand for a moment pondering her choice…then it all depends on her mood. It’s hard to get too mad at her, though, when she does that terrier thing. Because when she does choose to return, it’s always with that wagging tail and bouncy stride, so excited to do whatever I want to do…as long as it’s on her terms. Peppermint is such a classic. It would be very hard to get mad at her especially when she prances back all wags and with no guilty expression. I guess It is hard to get a terrier or any type of dog to come back sometimes especially if they have spotted a bunny or a kangaroo or etc. Have you ever tried yummy food rewards as a temptation for her to come back? They usually work brilliantly and then you can phase them out. I once looked after a terrier that used to escape alot according to her owner. Fortunately when she stayed with me, she always came back whenever I called her. I think it was because my two boyz don’t have terrier in them and respond immediately to my calls. Thank you Rayya! She is a character. If I use treats she does listen much better, and I should probably have some more training sessions with her to remind her of how rewarding it is to be obedient! PS: absolutely love Peppermint’s stunning picture. Btw, what is she crossed with? I’m so happy that you asked! Actually, she is called an Australian Jack Russell. Her parents were both imported from Australia, and I got her from the breeder who is a well-known foxhunter here in Virginia. I have done some basic Googling but haven’t found much about her type in Australia. 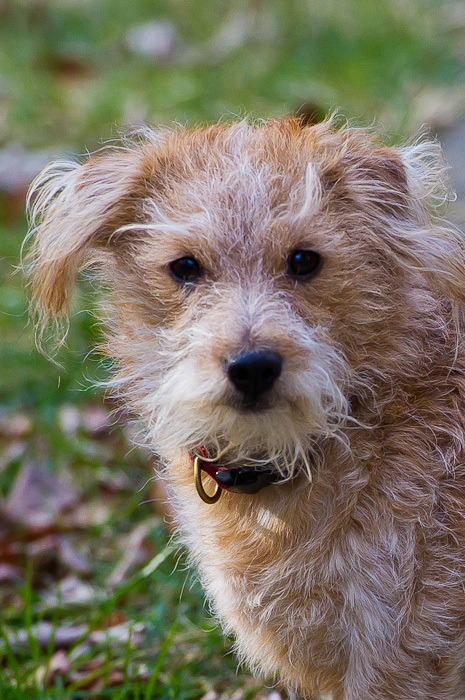 Have you ever stumbled across a terrier that looks like her? Her parents both look exactly like her. Jack Russell size with fluffy coats and great dispositions. My dog must’ve had some terrier in him. He would do the same thing, except instead of a shrug he would actually shake his head no, snicker a bit and then go on about his business. I sure miss him. My old Jack Russell was actually less obedient than Peppermint. The funny thing is that he always listened when it mattered. It’s like he almost knew when it was important and when it wasn’t!